Watercolor tags and cards look so pretty! And they’re super easy to make. Watercolor paper. For these tags, I used the cheap paper that comes in pads for $5 or so. There’s no need to use your expensive paper for the tags but the weight should be 140 lbs rather than the 90 lb version. Watercolor paints, any brand is fine. White gel pen or white paint for lettering and designs. Stamps with white ink pad (optional). Twine or pretty ribbons to tie your tags. For creating the tags themselves, I simply used my paper slicer to crate the rectangle shapes. As you can see by my photo (at the top), I made my tags in different lengths and widths for a bit of variety. I used scissors to snip off the top corners though you’ll need to be a bit careful here to ensure that you snip the same size of paper from each corner. I wanted to make my tags full of bright shades of blues and reds. I started with the darker colors at the bottom and moved up with lighter shades of blue and red. 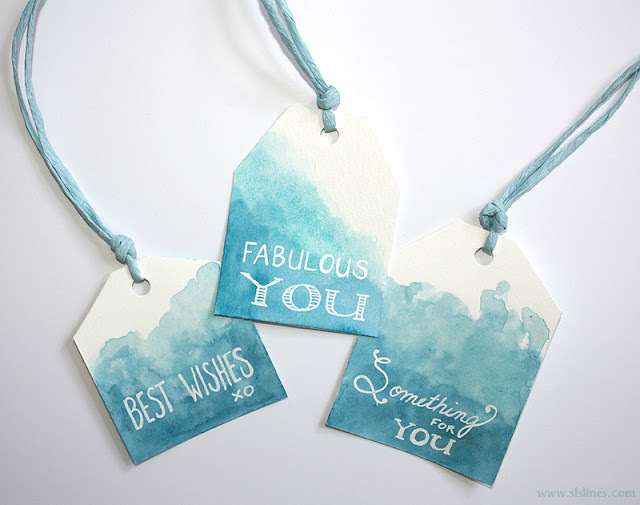 You can basically do what you like here – be it a strip or a ball or even a single color covering the entire tag but you will want to try and get some color variation happening so you get the full watercolor effect on your tags. The brand of watercolors I used here is Winsor & Newton’s Professional Watercolors though you could use any really, even child’s watercolor paint. But the colors won’t be this bold and saturated with kid’s paints. Once your paint is dry, it’s time to add a pretty design or a sentiment. You could paint the letters on if you have a steady hand a small paintbrush but I prefer to simply use a gel pen. I always use the Uniball Signo since it’s my favorite white pen but others will work too. Another option is to use your stamps and white ink pad as I did below in the bottom photo. The stamps look fabulous too! Another option is to paint a simple little flower or set of leaves on your tag as I’ve done in the bottom photo. To create the holes, I used a hole puncher and then added my twine and ribbon. Voila! All done. If you don’t want to make your own or you don’t have all of the materials, I have a print and cut freebie version that you can download. You can still make your own! Please check out the blog post and the downloadable file here. Here’s my blue set! Happy creating.